« What class should I review next? Oink! 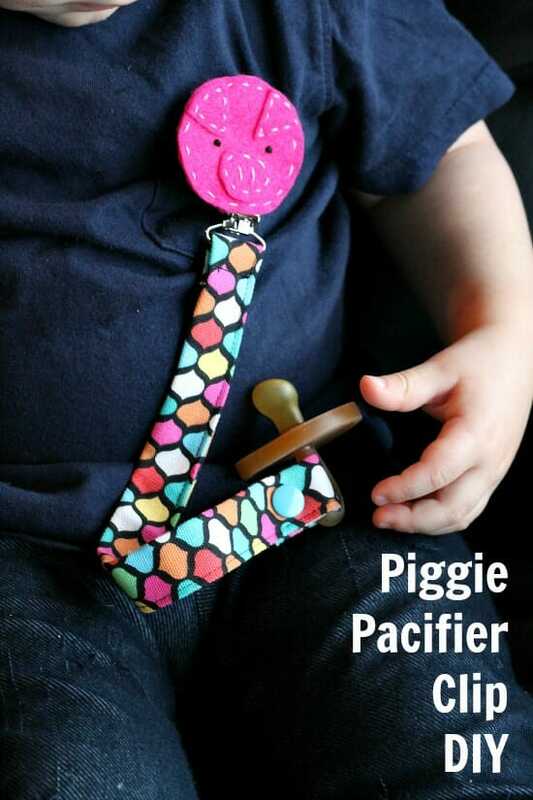 Stephanie from Swoodson Says here, I'm sharing a quick and easy pig pacifier clip tutorial today. My son never took to a pacifier very well but I know when he carries things around, the last place I want them to end up is left in a shopping cart or on the floor! The felt piggie adds a special touch and could be swapped out for any other animal face. I never pass up a chance to add an animal when sewing for babies — if you're looking for more ideas, check out my list of Free Softie Patterns + Matching Kids' Books. I want to be clear – use caution when sewing things for little ones! If safety is a concern, you could alternately use velcro for both closures instead of sewing and using the KAM snaps. Make sure nothing is loose before using. 1. Press the short fabric rectangle ends up 1/4″. 2. Fold the rectangle in half length-wise, press. 3. Open and fold the long edges inwards to the center pressed line, press. 4. Fold all in half, press. 5.Sew along all three open ends, being sure to backstitch at both start and ending. 6. 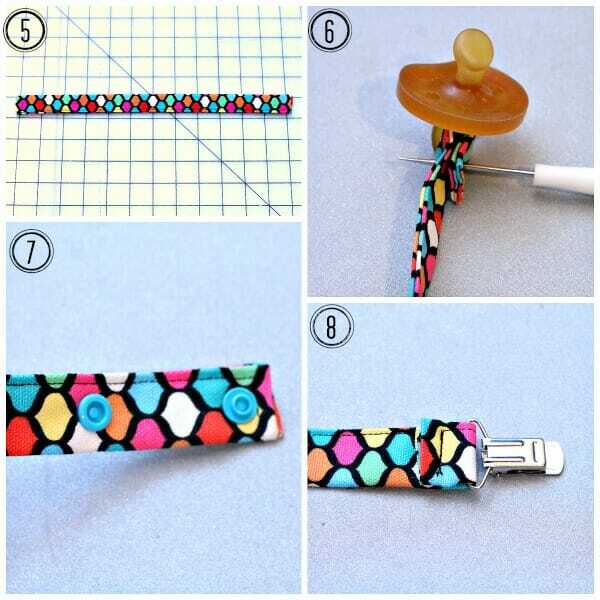 Use the awl to mark placement for both Kam snaps, making sure that they will meet when looped through the pacifier. 7. Use the pliers and insert both snaps. 8. 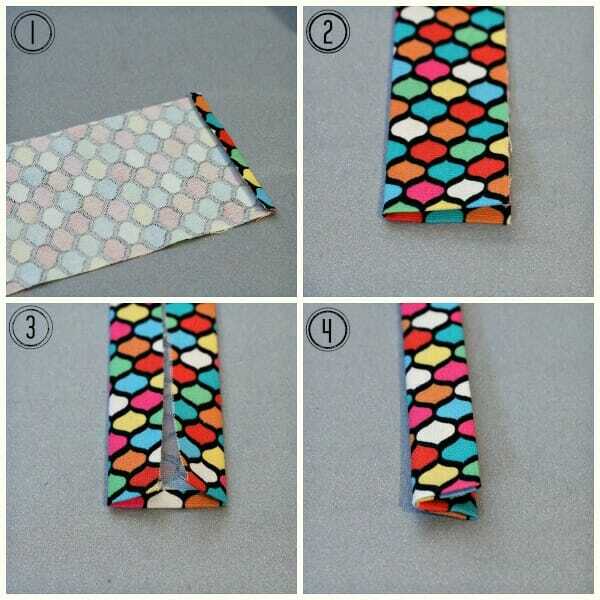 Thread the other end of the rectangle through the mitten clip, and sew securely. 9. Hand stitch the ears and nose on, making small knots for the eyes. 10. Stitch the front to the back face piece, wrong sides together. At the middle bottom, leave a small opening and only stitch through the top piece. 11. You can see the opening better here. 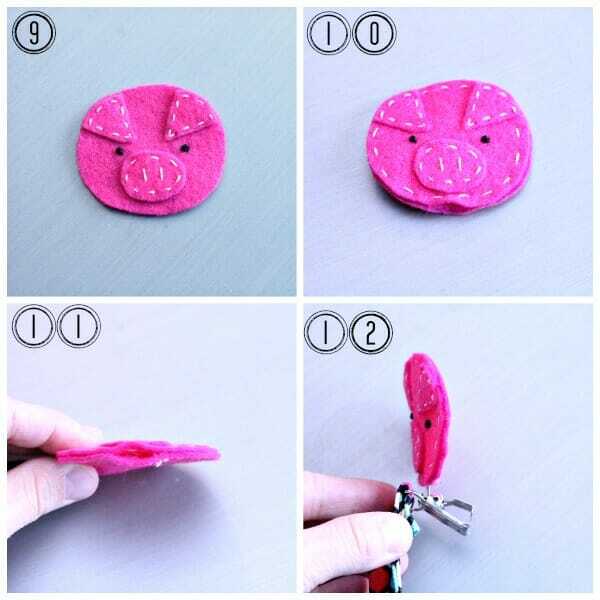 12.Open the mitten clip and slide the largest, front single piece inside the pig face. 13. Carefully insert hot glue inside the clip and let cool, securing the pig to the clip. 14. Ta da! You're done.